That will do a move at a constant 2575.9 mm/minute, as you would expect. The latest Java host software in the repository now supports all this (again you can turn it all off by setting Accelerating false in the preferences). There is one final firmware upgrade needed to finish this work off: buffering the moves in the micro-controller (as Zach and co. are doing with their code). At the moment there is a barely-perceptible pause between moves, which means that accelerating to high speed hits a momentary barrier at the end of the acceleration. As the whole point of all this is to make the machine move much more smoothly, that's got to go. We've been really busy with MakerBot trying to keep up with orders and such, but sometimes we like to have fun too. Our friends Marius and Phillip from metalab in Austria are visiting for the month and they have been printing cool things ever since they got here. The difference in operation of the no-lathe extruder with different barrel lengths and a heatsink leads me to suspect that the main factor in reducing friction is to reduce the size of the zone where the plastic is actually melting. As you can see in the photos I've chopped an old CPU heatsink (easily salvaged or made from copper/aluminium stock) into 10mm slices, and clamped a pair around the barrel. 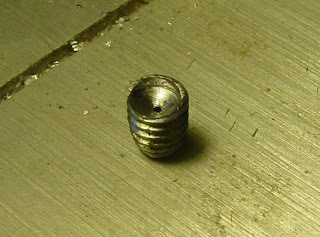 There is a recess in the middle of the two halves made with a drill 0.5mm smaller than the barrel's external diameter. I have experimented with moving it up and down the barrel. The barrel above the heatsink does nothing useful in this setup, but might be useful for guiding the filament later. The heatsink stops the plastic melting on entry, keeping the top part of the barrel under 60C. I've rewound the heater to start the coil as close as possible to the nozzle, and to keep the windings close together. Kapton tape is great for this! Best results definitely seem to be had with a small, powerful heater (1A@13.8V max, running at about 60%) and the heatsink placed as close as possible to the heater windings. This is much more successful than my earlier experiments with heatsinks. The extruder works continuously, or in bursts, and I checked that it will restart after cooling. It still needs no lathe! 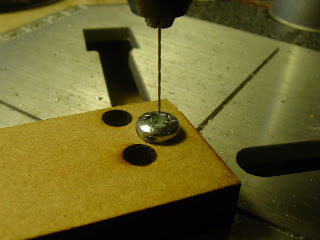 In which your narrator experiments with ways to make Nophead's GM-17/tin can stepper hack pinchwheel extruder without a lathe... do you want to read more? I'm having difficulty stopping the barrel of the no-lathe extruder popping out. As the silicone warms up it seems to lose its grip on the barrel and the latter slowly slips out of the silicone/MDF clamp. 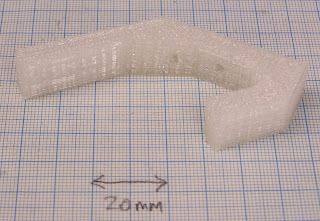 This combined with the extra material called for in the form of silicone tube is bringing me back closer to Forrest's and Nophead's extruder designs with long, thin-walled barrels and some form of heat-sink near the inlet. The RepRap Project is nominated for the "Project for Most Likely to Change the Way You Do Everything" category of the Sourceforge awards. If you think we're deserving of said title, click on the image and help swing the vote our way! In true Open Source fashion, I've been distracted by the attention given to extruders without a lathe and I've figured out how to make an extruder barrel and nozzle without one too. I used some handy but unlikely pre-formed components: A telescopic radio aerial and a posidrive machine screw. 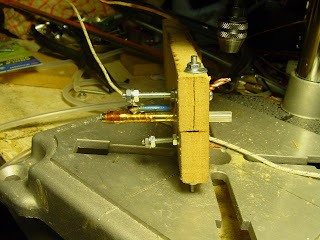 To repeat the trick, you'll also need some PTFE tape, kapton tape (or fire cement), 3mm inside diameter silicone tubing, nichrome wire, nuts, bolts, and bits of MDF or similar wood product.You will need a drill that can reliably make a 1mm hole – finer if possible – for the nozzle's exit, plus the usual hand tools. The coil of wire on the right is an improvised rheostat made from the guts of my expired fan heater (thanks for expiring it, Kate). I Started by dismantling the telescopic aerial, removing the base and very tip so I could slide all the bits apart. Find the tube that is a snug fit on an M3 or M4 posidrive machine screw. 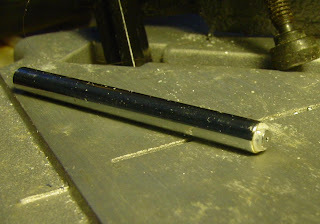 Note that one of the ends of the tube has a shoulder turned over on the end of it that stops the other bits of aerial slipping through – this will be the nozzle end. Chop off 50mm of tube and smooth the cut end. Economic note: More tubes with shoulders can be made by cutting lengths with a a pipe-cutter and gently hammering the cut end over, allowing one to make several barrels from one aerial. Hack off the top 5mm of the screw, tidy it up, and drill a shallow 2-3mm hole on top of the small hole you exposed with said hacking. You should now have something like a little grub screw with a hole through it. Why not put a hole through a grub screw? 'Cos I got no M3 or M4 grub screws. That is your nozzle. So wrap the little beast with PTFE tape and pop it down the barrel that you cut off the aerial pointy end first. It should wedge itself in the shoulder at the other end. If you push too hard you'll deform the barrel and pop the thing out the other end. Bad move. 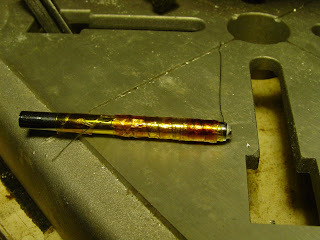 Insulate with kapton tape, add 6-7 ohms of nichrome wire near the nozzle, insulate again. That's your heater. Slip 10mm of a 25mm length of 3mm ID silicone tube over the open end of the barrel and clamp it all in MDF. I found it necessary to add an MDF slip over the top part of the silicone tube later on to stop the soft plastic bulging within the tube. 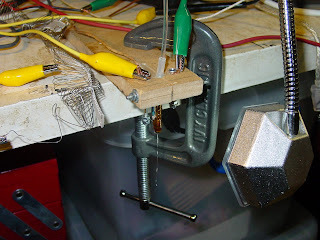 I used bolts to connect up the power to the nichrome and kapton-taped a thermistor probe to the side. The combination works well up to about 180C with PLA and is stable at temperatures of up to 300C by which time the PLA starts coming out as smoke rings. Surprisingly, the silicone stops the MDF from burning. So there you have it. 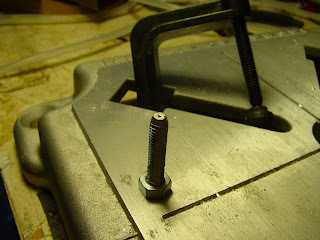 Easy to get bits, easy to make, no lathing. Wot? Another coat hook? So what's new here? The fact that it was printed in four dimensions, that's what. I've upgraded the Java host software and the Arduino/Sanguino G-code firmware so that the system treats the filament length to be extruded in each movement as another independent movement variable, like X, Y, and Z (as proposed here; you've got to have a stepper-driven extruder - like the pinch-wheel extruder - for this to work). 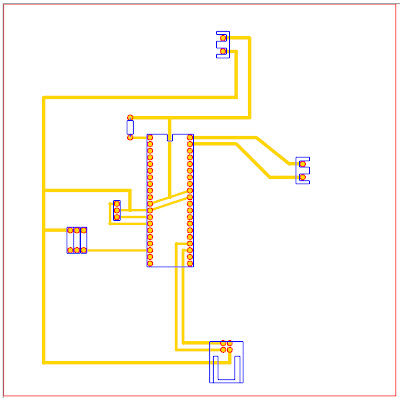 That is to say, the DDA in the firmware, which previously generated straight lines in (X, Y, Z) space, now generates straight lines in (X, Y, Z, E) space, where E is the growing length of extrudate needed. From the outside, this means that everything works exactly as before. So why bother? The reason is that it makes it a lot easier to do tricks like accelerating and decelerating the extrude head as it moves, which means that it can both go faster and run on less current. This will be the next thing that I do. I've done a new release of the host software in the repository available here, and written an upgrade to the Arduino/Sanguino firmware called FourD_GCode_Interpreter available here. To turn on 4-dimensional behaviour, simply set the flag FourD=true in the reprap.preferences file. Set it false to make the machine work as it did before. So, for example, the second line is saying move 0.7mm in Y from where you last were and extrude 0.7mm of filament while doing so, all at 3000 mm/minute. But if you leave the Es out and turn the extruder on and off separately, everything works just as before (so old G-code files will still work). You can still control the extrude rate separately too - just set the extruder to go at a different speed to the carriage, and everything comes out right automatically. Unsurprisingly in retrospect, this taught me something about the control of the stepper which drives a pinch-wheel extruder: you don't want to turn the current off between plotted segments. If you do, the stored spring energy in the compressed filament and the pressure in the melt chamber cause the stepper to slip back (as no current is flowing to hold it) at the end of one line segment and before the start of the next, resulting in a poor-quality build. The new firmware turns the current on when the extruder is first used, and leaves it on until the temperature is set to cool. The latter is a bit of a hack (and we could easily add a "current off" M-code instead), but in practice it works very well. The resulting build quality is excellent. In which your narrator solves the problem of recycling plastic scrap, for milling... do you want to read more? Nophead: This looks really promising, but I am having trouble understanding the physical arrangement from the photos. Any chance of a view from underneath, or a diagram? Forrest: Absolutely... do you want to see more?